The transfer day deadline came and went at 5:00pm this evening and the promised player that would 'Put Bums On Seats' failed to arrive. The speculation had been rife that it would be either Robbie Fowler or Lee Hendrie but it had been rumoured that their Bentley's would not have been able to get into the car park so our kind offer had to be declined. Fowler, speaking from his apartment overlooking Monaco Harbour said that he would have loved to come to Kidderminster to play but at £50,000 a week he felt that we would struggle to pay it even with the massive rise in crowds from 1,349 a week to 1,870 a week. Hendrie, once of local side Aston Villa, said 'Where the hell is Kidderminster? isn't that near to Bromsgrove?. When the interviewer said it was then Hendrie said that he would only play for the leading club in Worcestershire and no other. So we went with Michael Carr instead and to be honest I'd rather see someone young and eager like him here than some spent out ex Premiership prima donna. Carr signed for us this afternoon after being released from his contract at Morecambe a few weeks ago. He signed for them a year previously from Northwich Victoria after excelling for them in our double header Trophy games back in 2007. The 24yr old midfielder can also play at right back but it's his creative midfield play that had made him so highly thought of. 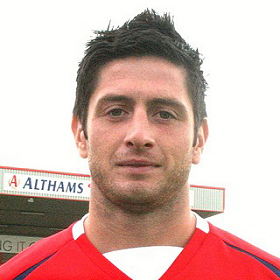 After starting his career at Macclesfield, where he completed eleven appearances, he signed for Northwich in January 2005 staying for just over three years. 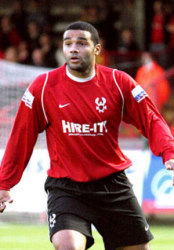 He was released from there in May 2008 to join Morecambe as one of their first signings on being promoted to the Football League but failed to hold down a regular starting place and was released from his contract in January this year. He'll be staying at Aggborough until the end of the season and presumably will be offered another contract for the following season if all goes well. For once we had no players going the other way but loans will still be allowed so expect to see the likes of Michael Bowler and Paul Bignot moving out soon. Other news today came in the form of the draw for the next round of the FA Trophy. If we get past snowbound York City tomorrow evening, or whenever it is played, then we'll meet up with either Havant & Waterlooville or Crawley Town. If I had a preference it'd be Hereford & Worcester, sorry, Havant & Waterlooville, because we've only played half the team. It was way back in 1982/83 that we played Waterlooville, before they merged with their neighbours, in the Southern League and beat them both times. If we do get to play York tomorrow then Carr will not be eligible to play because he signed for us following the game on Saturday. That makes you wonder that if he had signed for us before the game could he have played in both games. I probably won't be doing a preview of the replay but suffice it to say that Mark Creighton is back in contention for a start after sitting on the bench on Saturday and we have no other injuries. City will still be without their loanees and now they will also be without full back Ben Purkiss, who played on Saturday despite still feeling the effects of his recent stomach injury, and will join fellow defenders David McGurk, Darren Kelly and Mark Greaves on the sidelines for the replay. There's just time for a bit more news. The first is that former striker, and Aggborough favourite, Iyseden Christie (above right) has signed for Torquay Utd after being released by Stevenage late on Friday evening. He was supposed to be signing for Kettering Town but that fell through and is now subject to legal proceedings between both clubs. Issey's signed for Torquay for the remainder of the season. And finally congratulations to Martin Riley on his call up to the England 'C' squad for their friendly game against Malta on February 17th. That's also the date set for the Worcester Senior Cup game at Stourbridge so he might yet turn the England game down.